This year’s show was held at the grounds of Hoshi Koi in Puyallup, Washington this past August 7th and 8th. Despite adverse weather the show was concluded without a hitch. The numbers of koi were down a bit from the previous year but the quality was up. The show was judged by the husband and wife team of Pat and Larry Christensen up from the Portland, Oregon area. The show was co-chaired by the husband and wife team of John and Cindy Hillstrom who despite the stress have volunteered for another year. There seems to be something to this husband and wife combination as the team of Sharon and Dan Olson walked off with the Grand Champion award with their high quality kohaku. Patti and Phil Ricigliano ( Phil is President of Puget Sound) took Reserve with a dramatic Showa whose dominant black was deep inky blue! Third best fish in the show was the best in size Gin Rin Sanke of.... you guessed it Gene and Phyllis Anderson. Both the Olsons and Andersons had to cross the Mountains from the Inland Empire Water Garden and Koi Society to again support the show this year. This was a very Special win for Sharon and Dan as it was their very First Grand Champion trophy. I have watched these two and am very proud of the tremendous work they have accomplished in keeping and selecting koi in a relatively short time. They and the Anderson's both would be my choice for people to turn to to learn the ropes about keeping koi. 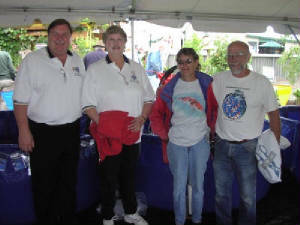 The PNKCA trophy was awarded to Phil and Patti Ricigliano of Puget Sound Koi. 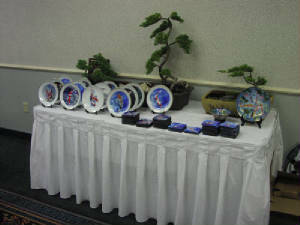 Phil by the way used his considerable skill as a bonsai artist to create living trophies for the top three prizes. I would be remiss in my duties as a reporter if I failed to mention our PNKCA leader (Jerry Tyler and his wife Jo Ann) took a few prizes themselves including first with a Kumonryu that also garnered the Inland Empire's friendship award.